In celebration of World Oceans Day, we are pleased to welcome our guest blogger, Alex Smith. He shares some of the inspiring boat-themed playgrounds he’s found in Nova Scotia and Quebec on Canada’s east coast. “Lobster!” cries out Noah enthusiastically. “I’ve got another one,” Nellie shouts into a gust of wind. 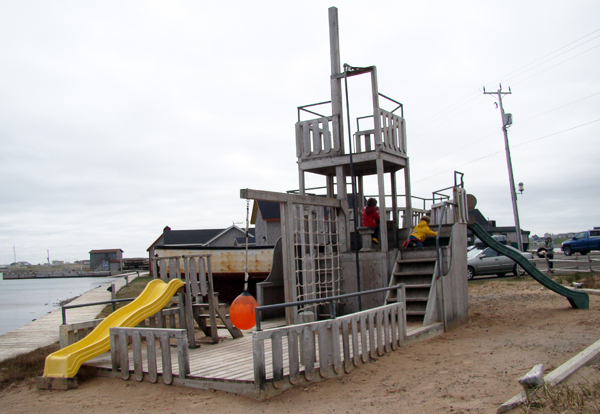 We are in a playground adjacent to the fishing harbour of L’Étang-du-nord in Magdalen Islands—a small archipelago on Canada’s east coast. Not everyone here is a fisherman, but with $50 million (Cdn.) in annual revenues, it’s the most important sector of the local economy. During our short stay, we come across two lovingly crafted fishing-boat playspaces. One trumpets the bright colors of Acadie—blue, red, and yellow. She’s built to scale and can hold plenty of stacked traps on her aft deck. 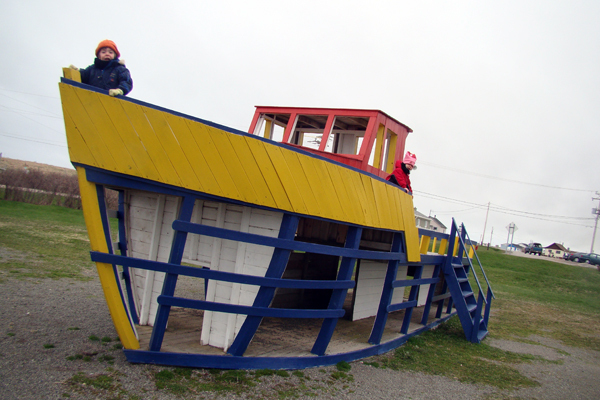 This is a popular spot with the two newest crew members of the Étang-du-nord fishing fleet, and we return for a second visit of imaginative play. The chilly weather is not a deterrent. The life-size prop for make-believe is a powerful magnet. There's much the same excitement at another boat about nine miles south in Havre-Aubert. This is a fishing vessel situated at the end of the historic La Grave stretch. The kids are in fine fettle, flowing between the three levels of play and each taking turns as captain in the wheelhouse. Back on mainland, in Bedford, Canada, I find a loose replica of HMCS Haida, a ship that served in the Royal Canadian Navy during World War II. This playscape has been a real draw for families since it opened in 2004. Even in the chill of late November when we first visited, there was plenty of kid-led clatter, deck-defying feats, and wondrous climbing to exceptional heights. Both communities have chosen playgrounds that are reflections of themselves. They are not of the mass-production mold. Their look and character are intrinsically their own. The world of play would be a much better place with more of these vernacular playgrounds that celebrate local culture and history. 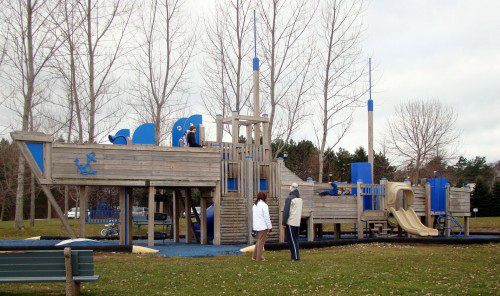 Know of any boat-themed playgrounds? Send photos our way!